WaterSong at RiverTown is a 55+ community in St. Johns County, Florida, near Jacksonville. This community from Mattamy Homes will include over 800 attached and single-family homes upon completion. Located within the larger master-planned community of RiverTown, this age-restricted neighborhood will feature its own exclusive clubhouse as well as access to the RiverClub Clubhouse. Active adults looking for new homes for sale in St. Johns County, Florida will want to see the luxurious lifestyle offered by WaterSong at RiverTown. Residents at WaterSong at RiverTown have access to all of the amenities within the master-planned RiverTown community. The RiverClub Clubhouse features a waterfront cafe, fitness center, yoga studio, and game room. Outdoors, residents can enjoy the zero-entry Oasis Pool, Olympic-size lap pool, sun deck, patio, fishing pier, kayak launch, boardwalk, playground, and miles of nature trails, all with views of St. John’s River. Mattamy Homes also plans to construct a clubhouse exclusive to active adults in the WaterSong at RiverTown neighborhood. Mattamy Homes began construction of WaterSong at RiverTown in 2019 and plans to build over 800 attached and single-family homes. Homebuyers will have a variety of customizable floor plans to choose from, allowing them to construct a brand-new home that fits their preferences and needs. 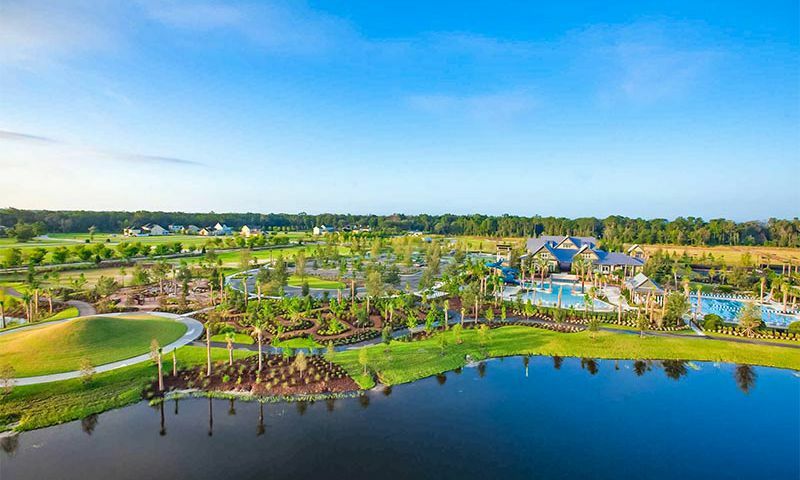 WaterSong at RiverTown is located in St. Johns County, Florida, a sought-after area that puts residents in easy reach of daily needs and fun opportunities. Residents of WaterSong at RiverTown are close to any daily conveniences they need, including Publix, Winn-Dixie, and Walmart, as well as CVS and Walgreens. When dining out, restaurants such as Woodpeckers Backyard BBQ, Corky Bells Seafood and Steaks, and La Casita Mexican Restaurant can be found nearby along the St. Johns River. When residents are looking for entertainment options, they’ll find them at the St. Augustine Wild Reserve and the World Golf Hall of Fame. WaterSong at RiverTown residents who want to get outside have plenty of options close to them. Golfers will find multiple prestigious courses to play nearby, including World Golf Village, The Golf Club at South Hampton, and Magnolia Point Golf and Country Club. There are also multiple green spaces and parks to choose from, including Aberdeen Park and Black Creek Park and Trail. The St. Johns River that runs along the banks of this community offers opportunities for outdoor recreation and water sports. Just under 30 miles away, the shores of the Atlantic Coast beckon for day trips to the beach. WaterSong at RiverTown is also close to multiple healthcare providers, including Baptist Medical Center South and Kindred Hospital North Florida. Residents who want to visit nearby metropolitan areas are in luck. WaterSong at RiverTown is 45 minutes to Jacksonville and 40 minutes to St. Augustine, providing easy access to everything the city has to offer. For longer trips, the Jacksonville International Airport is just under an hour away. There are plenty of activities available in WaterSong at RiverTown. Here is a sample of some of the clubs, activities and classes offered here. 55places.com is not affiliated with the developer(s) or homeowners association of WaterSong at RiverTown. The information you submit is distributed to a 55places.com Partner Agent, who is a licensed real estate agent. The information regarding WaterSong at RiverTown has not been verified or approved by the developer or homeowners association. Please verify all information prior to purchasing. 55places.com is not responsible for any errors regarding the information displayed on this website.